Last weekend I was in Glasgow. I’ve never been there before and really enjoyed it. The city has so many interesting things to see and the people are very friendly. One of the places I went was the Kibble Palace, a glasshouse at the Botanic Garden, and that is where I took this picture. 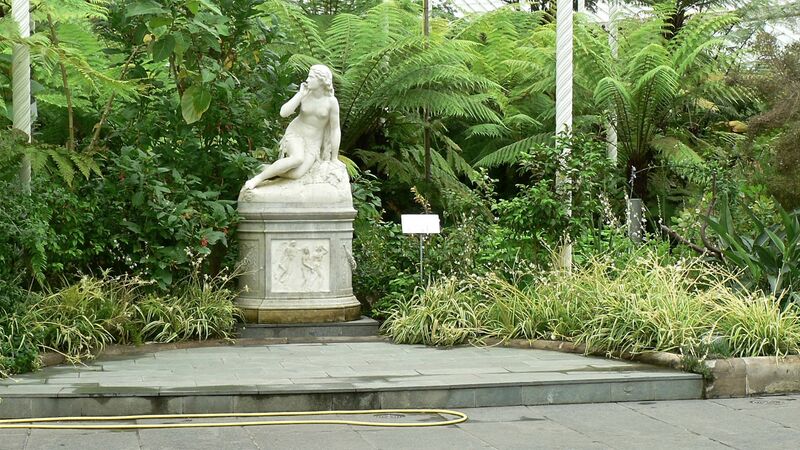 She is Eve and lounges among part of the national collection of tree ferns. The Kibble Palace is named for John Kibble, a Victorian businessman and amateur scientist. The statue is by Scipione Tadolini, a well known 19th century sculptor. I did a couple of googles to find poetry of Eve. There’s certainly a lot of it and the interpretation of her characters varies from writer to writer. The Boston Review had a piece on a statue of Eve minus Adam, which I thought particularly appropriate.